John Calipari, now at Kentucky, led UMass to its only Final Four appearance in 1996, which was negated by the NCAA because of, among other things, academic probation. It’s Calipalooza for the University of Massachusetts Athletic Department this week. John Calipari, UMass’s former head basketball coach — a man who took the Minutemen to their greatest heights and lowest depths — will be honored Tuesday and Wednesday at events in Boston and Amherst. What an embarrassment for our state university. You’d think our UMass officials would have as much good sense as the president of the University of Memphis, who canceled a Cal celebration after initially thinking it would be a good idea to honor college basketball’s all-time bag man. Not our guys. Not here in the Hub of the Universe, and the great Commonwealth of Massachusetts. Our guys are going full steam ahead with the two-day event to honor a man who oversaw a program that broke rules and treated academics as an afterthought. 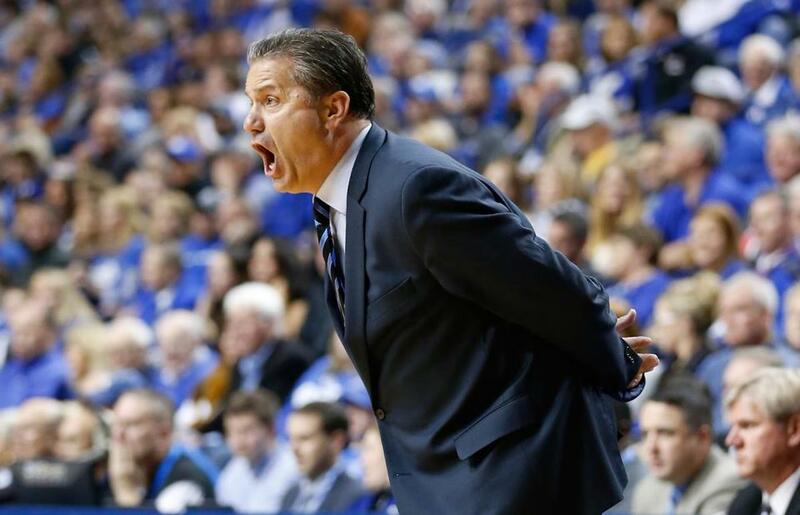 Tuesday night at the Colonnade Hotel is your chance to enjoy “An Evening with Naismith Basketball Hall of Famer John Calipari.” For a mere $300, you can rub elbows with Coach Cal and listen to stories of the golden days of UMass basketball, when Calipari took the Minutemen to the Final Four. That was one of the more thrilling sports stories of 1996 and it remained a wonderful memory right up until it was learned that star player Marcus Camby already had turned professional while he was still playing for UMass. Camby had a couple of agents and had been the recipient of cash, thousands of dollars worth of jewelry, and the services of prostitutes while he was playing for coach Cal (Camby’s jersey number already is retired at UMass, so go figure). After the Camby disclosures, the NCAA spanked UMass, fining the school $151,000 and forcing UMass to erase its Final Four appearance. In NCAA parlance, UMass’s Final Four appearance was “vacated.’’ It never happened. Cal was long gone when the sanctions came down. After the Final Four, he bailed on UMass, signing a $15 million contract to coach the New Jersey Nets. None of this is problematic at UMass. Here they are, 20 years later, raising money for the basketball program with a “night” for Coach Cal, which will be followed by a halftime ceremony Wednesday when Calipari’s name will be raised to the rafters at the Mullins Center on campus in Amherst. I enjoyed the 1996 UMass run as much as anybody. My UMass friends wouldn’t trade it for anything. I get it. Those were great times to follow UMass basketball and it was exciting to have a local team in the Final Four. But we eventually found out that the whole thing was a deal with the devil that poisons big-time college sports. In the end, we were no different than bandit programs we mocked at UNLV and New Mexico. And now our State U is honoring the man who was in charge during the scandal. UMass is not the only blemish on Cal’s NCAA résumé. After failing in the NBA, Calipari returned to the college game and soon had Memphis in the Final Four. But guess what happened? It turned out that somebody took an SAT test for Memphis’s best player (Derrick Rose) to make him (Rose) eligible for college and the NCAA came back and vacated Memphis’s NCAA appearance. Two NCAA Final Fours. Amazing. After getting out of Dodge again, Cal landed in the blue-green grass of Kentucky, where he runs an NBA farm team disguised as the Kentucky Wildcats. He gets all the best high school players and many of them make it big in the NBA. Kentucky annually contends for the NCAA championship. No vacancies. Yet. Cal is on a roll. He was AP college basketball Coach of the Year last year and was inducted into the Naismith Hall of Fame in Springfield in September. Bravo, Prez. We could use some of this leadership here in the great Commonwealth of Massachusetts. But no. Instead we get a $300 per ticket night at the Colonnade, a halftime celebration Wednesday night at the Mullins Center. Yahoo. I traced down Bamford Sunday and asked him whose idea this was. Any reservations on your part to go ahead with this? Any negative blowback from alums or anyone else? Armed with this information, I checked with UMass president Marty Meehan. Like Bamford, Meehan was not around when this decision to honor Cal was made. Meehan, a sports buff and a Massachusetts lifer, became president of UMass July 1. Any reservations or misgivings about this? OK, then. Sounds like a swell time for everybody. Follow Dan Shaughnessy on Twitter at @Dan_Shaughnessy.